Check in 7:30 - 8:30 a.m.
Race starts at 9:00 a.m.
​Please click the link below to register! Prefer to register using a mail-in form? Please download the pdf brochure. Same-day registration is also available 7:30–8:30 am, Saturday, June 17 at Kohler School, 333 Upper Rd, in the gym lobby. 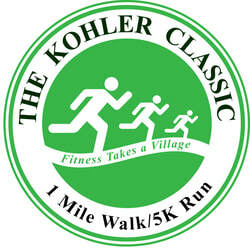 Dust off your running shoes and get ready for the Kohler Classic! in between. Both races will begin and end in front of Kohler School. Walking Division: Open to anyone interested in walking the course. This is a non-competitive event; walkers will not be timed. Strollers and wheelchairs are welcome in all events. respective grade level. All children receive a medal of participation. and 1st, 2nd, and 3rd place finishes. guaranteed to first 100 — register early!!! Thank you to everyone who made the June 2016 Run/Walk a huge success! and La Weser 22:18. All of the results are posted at Kohlerschoolfriends.com. generosity of our sponsors. Your support is greatly appreciated and we are proud to list your names. Striders. Also a special thanks to Chief Rutten and the Kohler Police Department for keeping us and our course safe! Lakeside Bottling Co., Prevea, Sargento, Art Imig’s, and Dr. Linda Bryce – Family Dentistry. Magestro Orthodontics, and Kennedy Ford.